Your aim is to get the judge to look at your honey – it must have no obvious faults which allow the judge to put it aside. A big torch – which makes finding what’s in the honey easy. Tasting rods – the flavour and texture matter a great deal. A copy of the schedule and the rules (which s/he has read carefully), so stick close to them yourself. selection – choose the best for :- clarity, taste, scent, colour, and have enough for 3 jars minimum. grading – use a grading glass to be sure which class to enter. The two grading glasses show the boundaries between light and medium and between medium and dark. filtering can improve chances. There are many methods, but lint from filters can destroy your chances. jar selection. jars must be truly matching (same maker and type – look on the bottom), though the mould numbers on the bases no longer matter, and must be the correct type as specified in the schedule (usually standard 1lb squat with gold lacquered lids). lids – must be clean, rust free, honey free, matching. It's surprising how often this is badly done. Do not use second hand lids in a show (if ever). If it says gold lacquered don’t use plastic lids! getting rid of incipient granulation is best done in bulk. Trying to improve just one jar is often very difficult. The effects of heating can change colour and taste. If you must, try a short time in a microwave rather than longer heating..
pollen in honey is not a fault and can be a selling point in every day trade, but it can easily be mistaken for granulation by a judge so it's best to put in really clear looking jars for showing. Too much pollen downgrades your entry. removing specks: - using a tube or straw they can be sucked out, but it's better they were not there at all. Many specks come from putting perfect honey into dusty jars. It’s easy to wash teacloths so use good ones and wipe all jars with care. bubble problems – filling with the jars pre-heated helps stop air sticking to the sides. Allowing time for bubbles to escape whilst in the settling tank is the best, so prepare in good time, let the honey settle and fill jars slowly. Bubbles under the shoulder of a jar can easily be dislodged using a clean bent wire, then skimmed off later. correct weights – weigh some test jars full and empty so that you know you are giving correct value. Many people fill to just below the "filling line" which gives short measure and eliminates them from the prize list. As a rough guide, no air space should be visible below the edge of the closed lid. What is the difference between naturally granulated (=naturally crystallised) and soft set (= creamed) honey? This is often not clear, but in general NC has set from clear liquid in the jar and has a grainier texture, whilst soft set has been seeded and stirred in bulk until just before it sets, then poured into jars. It has a smoother texture and often a flatter plainer top surface. Some soft set shows streaks up the side of the jar because the crystals were lined up by ascending bubbles just before it set. All set honey must be SET, i.e. it is not mobile and would not run out of a jar left lying on its side. The idea that 'creamed' honey should be a creamy liquid is wrong. Don't use a whisk! Seeding for even setting and good granulation. Judges tend to prefer small crystals with a smooth feel on the tongue, so avoid long slow crystallisation that produces sandy hard grains. This can be done by careful seeding of clear honey with a sample that has the right texture. Mix in a pound of your best set honey, stirred up, with about 20 pounds of liquid in a tub, stir, be patient, re-stir, then in a day or three when there is some sign of crystallisation, bottle slowly and carefully, avoiding trapping bubbles. Importance of good surface – how to achieve this? Skimming well before final setting helps, as does setting undisturbed in an even temperature. Make sure your shelf is level. 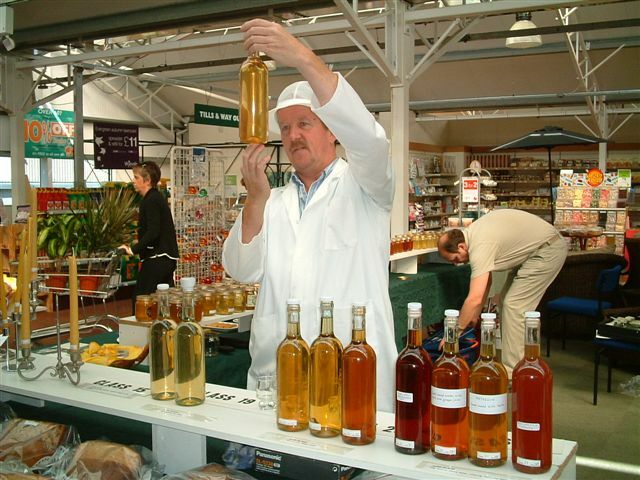 Soft set honey timing – seed and stir, then bottle about 7 days before the show. Do it in batches. Have spare jars to each batch so you can test without spoiling show jars and can substitute if you find a fault..
Use of OSR honey to start granulation in other honeys is often successful. Problems with temperature. Sudden changes, particularly cooling, cause frosting - contraction of honey inside jar and of liquid component inside crystal lattice. There is no cure for frosting but it is not generally considered a serious fault, other things being equal. Microwaving honey. (No lids!) As a general rule, 1 minute per pound, but judge by results because heating one jar for one minute can give a different result from heating 6 jars for 6 minutes. Melted set honey usually throws a mist of bubbles. Allow for these to rise and be skimmed off along with wax and other debris that is always present. In general keeping show jars for later shows does not get the desired results as stored jars always develop faults and faults are almost never cured by keeping. It's best to start from scratch for every show. The judge wants:- absence of pollen, no crystallisation whatever, uniformity of honey (combs often have two or more colours in them), good taste and scent. The judge will use a strong torch so check with your own torch, shining it through the comb from behind. Cleaning a frame takes care and time. Dirty frames seldom win. Use a small sharp scraper or knife. Leave no dust on the honey. Containers must be beeproof and glass sided (and easily opened). Ensure matching pairs must truly match, weights must be as schedule (gross, or nett, within limits stated, and matching). There should be no liquid honey in the box, so drain the cut block well before putting in. Cut it to fit and drain it on a cake rack overnight. Types of container should be standard – don't try fancy alternatives. A cut comb is inspected much as whole comb, for crystals (none) pollen, colour, taste and aroma. The judge always tips the comb out to see the other side, so does not want any loose liquid in the box. Sections old style and rounds. General points as for other comb + good clean box. Special honeys – Ling, Bell heather, Chunk. Ling heather sets like a jelly. 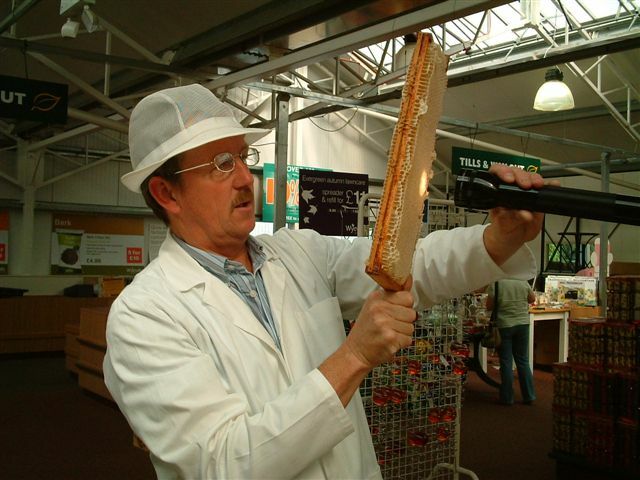 The test is to draw a line across the surface with a tasting rod. The line should stay there and not fill in. With other honeys mixed in, it flattens after a little while. The distinctive taste and smell are looked for, but colour can vary according to where it came from. Bubbles trapped in the honey show it to be ling, and they should be fairly even, not too small, and evenly distributed. If they rise the honey is probably a mixture. Bell heather honey is only seen in special places like Ireland and Scotland. It is a clear dark red and liquid (unlike ling) and has a very distinct and lasting flavour. no floating debris or bits of broken wax anywhere. comb cut the right way up - it's a fault to put it in sideways or inverted. underweight – check weigh your empty jars, weigh your full ones and subtract. dirt / hair in honey / rusty lids / specks in bottom of set jars. This judge often uses a high power lens so as to be able to identify objects in the bottom of jars. Try it yourself. not matching – includes jars, lids and honey, all must match as a pair or group. dirt or crystals on inside of lid – honey in the threads (honey + tin = black goo). scum of bubbles on surface of liquid. So skim carefully a day or so before the show. Jar should be over-filled enough to allow skimming to leave correct weight in jar. crystallisation in combs. Just one cell crystallised can eliminate an otherwise good comb. pollen in cut combs and sections, too much pollen in whole combs for extraction. crystals in clear honey – includes incipient cloudiness. Some judges take pollen cloudiness to be crystals, so don't take this chance. Only enter truly clear honey. Wrong viscosity, usually too runny because water content above about 20%, which can lead to fermentation. A smell of fermentation will be a total eliminator. unevenness in combs – colour mixtures, lumpy cappings, un-flatness, caps below woodwork, not all cells full. poor aroma, or the lack of any. ling honey that isn't a true gel, due to other sources. Do standards differ at different shows? They shouldn't but they do. At a small show you can get away with minor faults, which would eliminate at a big one, hence prizes are more worthwhile the bigger the show. First thing the judge looks for is a good colour and clearness of the wax. S/He may shine a torch through it to check for cloudiness due to water content. Blocks should be:- correct weight; good colour; nice aroma when rubbed; flat topped, well cast with no moulding faults such as adhesions or lines; with no inclusions that show on the base, such as dust, which is easily seen, or water drops which leave little voids in the surface. Watery wax often has a creamy or milky look and may have colour differences in layers. Gently rub off any sharp edges using the palm of your (very clean) hand. Old blocks generally suffer surface damage and they lose their aroma, so cast fresh for each competition or short season. Try to find a nice presentation box so that your wax looks good – even though this is not supposed to influence the result. Some use special glass topped wooden boxes but a Ferrero Rocher chocolate box is a good substitute. -selecting your brightest (not necessarily the palest) colour wax but do not overheat it or it will go browner. -good filtering, although sedimentation over water can be very nearly as good with far less hassle. -only take wax for the mould from the top layer in the melting pot. Try not to disturb any sediment. -pre-heat the mould so no lines form on the sides of the wax. -very slow cooling as it sets, in particular cover the mould so that the wax does not cool from the top surface. There are all sorts of “tricks of the trade” about wax blocks, mostly to do with very slow even cooling to get e really flat topped block rather than the wavy surface that open-air cooling gives. The same rules apply but these must also be well-matched in colour and size. If you make two pourings from the same saucepan, the later one may well be a different colour, so have the full number of moulds. Better still, make too many all at the same time and pick the best. The wax must be good quality and colour just as for blocks, and well cast or made. Present your candles upright in firm fireproof candlesticks unless otherwise instructed as at The National. The candlesticks should not influence the judge – it's the candle and its performance that count. The wick must be correct thickness for the size of candle (this puts tapered and fancy shaped candles at a disadvantage). Wick should be waxed so that it stands well and is easy to light. Candles are always burned by the judge, so make an extra one and check this yourself. You are looking for a clear light, no tall smoky flames (the wick should self-trim correctly) no deposits collecting on the wick, silence because of no water drops hissing as they boil, no smouldering beyond about 20 seconds when blown out, and ease of re-lighting. I usually make a batch of about 15 and choose the best for the show. Flame should be clear and still with no spitting due to included water. A candle should not smoulder more than about 20 seconds when blown out or it may be hard to relight due to shortened wick. This can happen if the wax contains propolis or dust. The judge will re-light candles when cooled, to check this. Fancy shape candles often have serious faults when it comes to burning, such as bits falling off or tapers, meaning the wick is never the right thickness, Simple candles, well made from clean wax, usually win. These are classes where you must put a range of items as a group, say two kinds of honey and one wax item. The items in these are generally judged in just the same way as if they were in separate classes, but usually the judge awards points to each and adds them up for an overall score. This means you can get away with one poor entry carried by the other good ones, but two poor items is hard to compensate for. The usual class is a fruit cake, and this can be easily over or under cooked, split topped or sunken centred. There is no excuse for using a different recipe or other size of tin from what the schedule demands, but cakes from the same recipe can vary enormously. Outside cooked too much whilst centre undercooked. Cure: Slower longer cooking at lower temperature. Uneven fruit distribution. Cure: Mix with care. Mixture is too liquid, so fruit sinks. Some people dry the fruit first and coat it in dry flour before it is mixed in. Cracked top – the 'big smile' cake. Cure: Slow even cooking – expand contents before top makes a crust that has to split under pressure from below. Lack of honey flavour or smell. Cure: Use a good honey with a flavour that shows. Poor crumb structure – puddingy. Cure: Use only the best ingredients, flour in particular. Keep the air out of your preparations so that no acetic acid (vinegar flavour/smell) is formed. Be prepared to wait a long time for your wines to mature – some take years, so do sample tastings before you pick the ones for the show. I keep mine in plastic bottles (coke, lemonade etc) which do not impart any taste or smell and can have all the air squeezed out before sealing. They are also safer to store as they do not explode or break when dropped. Also, you can fill a 75 cl wine bottle from a 2 l plastic without disturbing the sediment. For the show have correct bottles – 750 ml clear glass wine bottles with shoulders, Bordeaux style, and a good punt in the base. You may have to buy some wine and drink it just to get the right bottles ! Fill to within about 1cm of the cork, which nearly always has to have a white plastic top so that the judge can remove it easily and replace it. Don’t put normal wine corks into a show. Filter your mead just before the show, with minimum exposure to air, so there is no sediment and not floaters. Wash the outside of the filter paper first in case there is fluff stuck to it. Coffee filter papers do a good job. 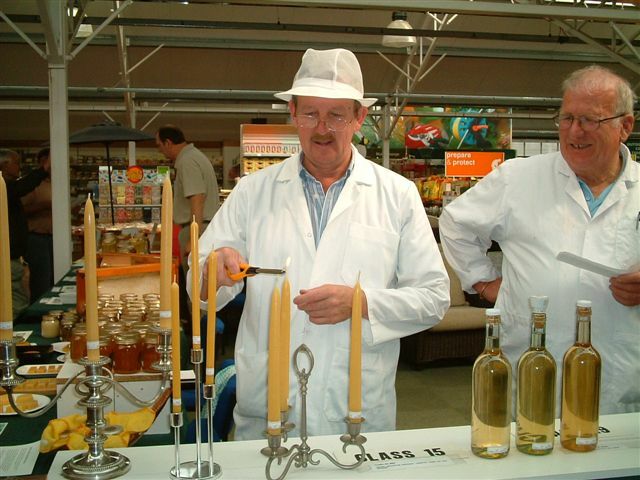 Displays are the hardest classes and demand a high level of preparation of a large amount of honey and wax. Not for the beginner usually. Even one jar with a small speck in it can eliminate the whole entry, so great care is required. 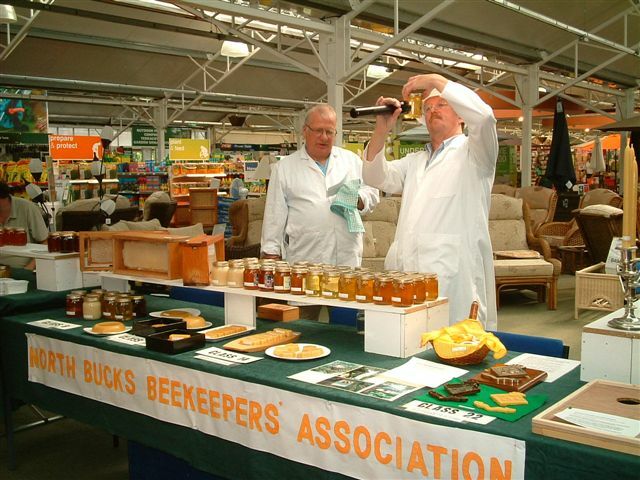 Rules vary from show to show very much but there is usually a minimum quantity of honey required. Imaginative and artistic display is an advantage but there are traditional styles, like the use of glass pillars and stacks of glass shelves on a mirror, which always go down well. Photos should be well displayed – usually in a properly cut card mount, and correctly labelled – usually this in the top right corner of the mount but check the rules of the show. A crisply focussed shot of a single interesting subject will always win over a general view of some people standing round a beehive. Sometimes there are separate classes for close-up shots or even for microscope photos and these can be the most rewarding to enter as the competition is usually few. Every novice should enter these as it is a sure way to improve your preparation and presentation of honey. You usually remain a novice so long as you have not won a first prize, so check the rules and keep trying. There are never many entries in a novice class so your chances are good. The only advice here is to make sure entries match the rules for the show. Try to persuade any children you demonstrate that they should enter shows as they are accepted even when not beekeepers or members – for example, talk to a primary school about bees and get the whole class to send in posters, drawings, stories, or whatever the rules require, to your own association show. Get the show secretary to put in a children's class if there is none yet.